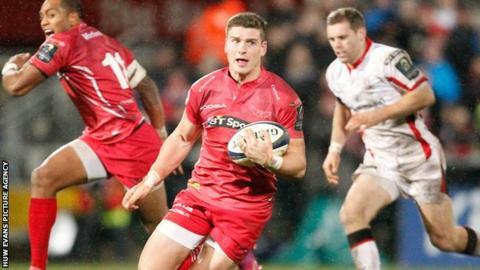 Captain Scott Williams says Scarlets need to follow up their victory over Ulster in the European Champions Cup with a win at Leicester in January. Scarlets climbed above Ulster to move off the bottom of Pool Three with a 22-13 victory over the Irish province. The result keeps the Welsh region's slim hopes of progressing to the quarter-finals alive. "We've just got to keep the momentum going and anything can happen," Williams said. Scarlets are now second in the group, two points above Ulster and level on points with Leicester, but five points behind leaders Toulon with two games to go. Five group winners and the three best runners-up will go through to the knock-out stages. Wayne Pivac's side are in Pro12 action on Friday with a trip to Cardiff Blues before they face Ospreys on 27 December. They host Ospreys on 3 January and are away to Glasgow Warriors a week later before European games against Leicester away and Toulon at home. Wales centre Williams is looking ahead to the forthcoming Pro12 games but says Scarlets will be wanting to pick up their European campaign on the back of positive results. "We've got to focus on the next couple of [Pro12] games over the Christmas period and make sure we carry our momentum back into this competition," Williams added. "It's going to be tough but we've shown in Toulon that we can compete with the highest level."